The Thermotronic 200 is an automatic varnish cooker to prepare varnish samples independent of individual operator skills.Even high resin contents do not effect the quality of the varnish due to the powerful stirring motor and the use of a magnetic stirring bar of high volume and weight. A special test tube with a round bottom is used in order to avoid residual material in the test tube. The filling weight of the test tube is 200 grams. For printing ink applications special brands of paraffinic or naphthenic oils are showing good performance. Naphthenic oils exhibit better solubility properties than the paraffinic ones. As in view of the VOC legislation aromatic compounds must be reduced or even eliminated, low-aromatic naphthenic oils have a growing market share in the production of printing inks. In most cases, these oils have shown to be usable, provides the resin is sufficiently easily soluble. Good varnishes can be prepared from resins and oils if the preparation method will be consistent and the number of variables will be reduced. This means that the resin must completely be dissolved in a controlled and reproducible way. The EUROCOMMIT group recommends to use the Thermotronic-system for this purpose. The new Thermotronic 200has the same features as the standard Thermotronic III, but is capable to prepare much more varnish in the same time. With the Thermotronic 200 one can cook 200 grams of varnish under automatic controlled conditions. All important functions like heating rate, dwell time cooling rate and stirring rate are controlled by the internal microprocessor unit. At the end of the temperature cycle a fixed end temperature can be defined by the user and an audible alarm sounds to indicate the end of the test. In practise it may be necessary to alter the resin concentration in order to adjust the viscosity of the sample in the right range. The Thermotronic 200 has a special oil inlet in the top test head for extra oil dispension during the test. In order to measure the rheological properties of complex systems like resin solutions, it is indispensable to use aThermotronic system. The new Thermotronic 200 is the ultimate system for quality control and laboratory applications in the printing ink industry. Consistent heating, cooling and stirring during the total preparation time. 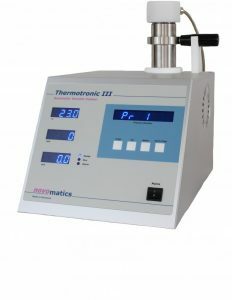 With the Thermotronic fast and reliable results are achieved automatically. The operator can run other test simultaneously.